The final addition to our camping trailer was the ‘Howling Moon’, a rooftop tent. 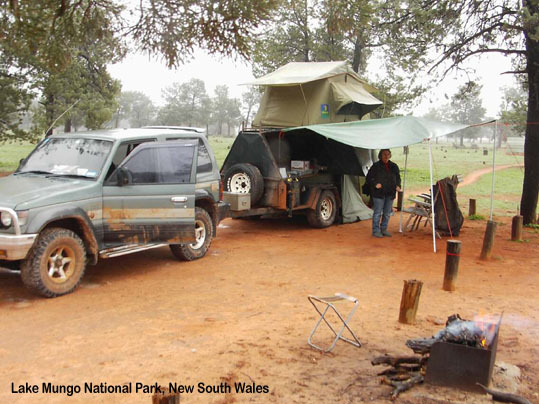 For many years swags were rolled out in bad weather and a tent erected in the pouring rain. There is no doubt that having a rooftop tent avoids all the fumbling with tents in the dark, twisted ropes, lost pegs, and trying to securing the whole thing in gale force winds. With a rooftop tent on the camper we can simply pull up and within five minutes a cosy waterproof tent has popped up. 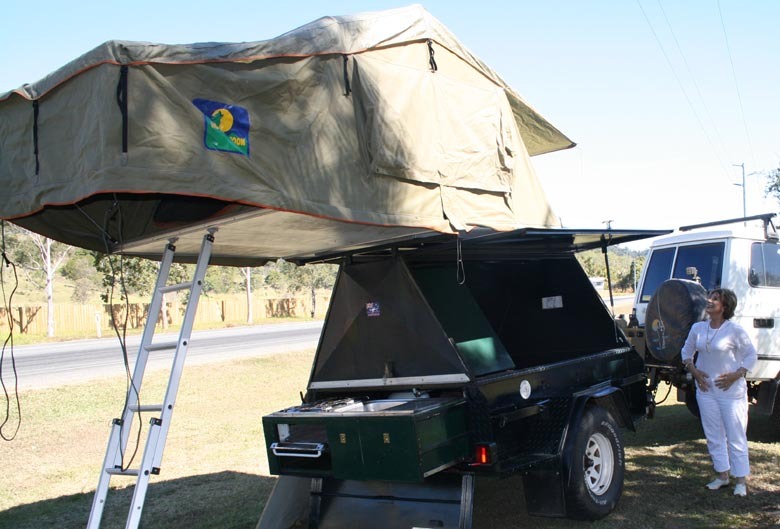 The Howling Moon rooftop tent is a South African design and development, and they have been thoroughly tested on safaris over many many years. 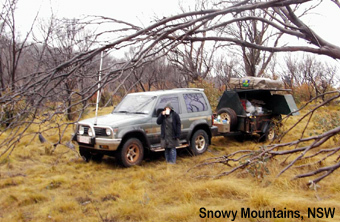 The units can be mounted on vehicles or trailers as per below. Once fitted with an annexe you have a very cosy camp environment. Packing up the tent is just as easy as setting up, and it folds away with your bedding in pace. 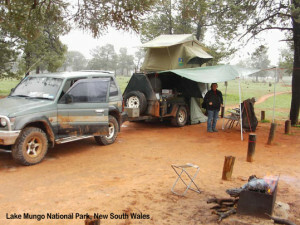 On a trip through Lake Mungo National Park in New South Wales with the camping trailer we were caught in torrential downpours. We had approached Mungo from the south, heading pretty much due North from Benanee and camping the first night in the Prungles lake system. As we left that morning it began to bucket down, and within an hour the roads were flooding. On a trip through Lake Mungo National Park in New South Wales with the camping trailer we were caught in torrential downpours. We had approached Mungo from the south, heading pretty much due North from Benanee and camping the first night in the Prungles lake system. As we left that morning it began to bucket down, and within an hour the roads were flooding. 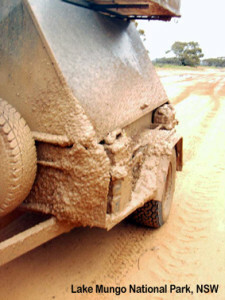 By the time we arrived at Mungo National Park the camper trailer was absolutely covered in fine abrasive mud. The roads by this time were closed, and we were the only travellers in the Park. Thankfully, the Park Rangers were very helpful and allowed me to use their wash down bay to hose the worst of the mud off.